I know you love to buy gold jewellery. But, whenever you buy gold jewellery, you should not make the purchase in a hurry. In this blog, we will discuss some of the do's and don'ts of buying gold jewellery. 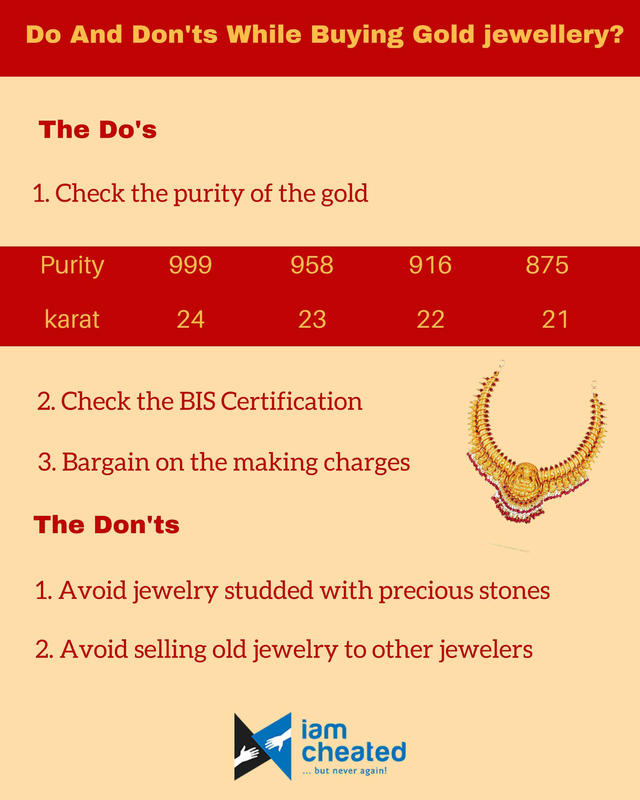 Before buying gold jewellery, you must check the purity of the gold. The purity of the gold can be checked through Karat and Fineness. The 24 karat gold is the purest form of gold. To make 22 karat gold, 22 parts of gold are mixed with 2 parts of Zinc or Silver. The Government of India has set up BIS (Bureau of Indian Standards), to certify gold jewellery and gold coins. BIS certifies gold jewellery by stamping it. Every BIS certified gold jewellery comes with a BIS stamp. You should look at the jeweller's identification mark, the year of the hallmark and the mark of the Assaying and Hallmarking Centre. You should also take a look at the purity/fitness like 916 (916 - 22 Karat). Jewelers pass the labour cost involved in making jewellery to buyers, in the form of making charges. Making charges are usually some percentage of the current gold price. So, making charges depend on the cost of gold. Jewelry with little artwork, will have less making charges when compared to jewellery with heavy designs. You should always bargain with the jeweller on the making charges. If you are buying gold jewellery studded with precious or semi-precious stones, you are paying more than it's worth. The problem is, it is very difficult to identify the purity of the precious stones in the jewellery. While buying gold jewellery, don't just pay the money. You must ask for the breakup of the gold and precious stones and then pay accordingly. Whenever you buy gold, most of the jewellery shops say that they have a good buyback policy and they give 100% of the value of the gold. But, it is advisable to sell the gold jewellery to the shop from where you have bought it. You will lose the making charges and some other costs.